With the arrival of spring in late March, London continues to heat up with a huge lineup of festive events and more pleasant weather throughout the month, making April one of the best times to plan a trip to the capital city of the United Kingdom. London in April offers plenty of warm, spring days when you can enjoy the fresh spring blooms at outdoor events around the city, but you should make sure you're adequately prepared for the season since the weather can be quite volatile this time of year. London's weather in April may not yet feel like spring, but it's considerably warmer than it is during the winter. Throughout the month, visitors will be treated to an equal mixture of overcast, wet days and days with bright, sunny spring weather. Fortunately, despite the old saying about "April showers," this isn't the wettest time of year for London—which only gets about 1.6 inches of rain over the course of 16 days—but you will still likely encounter some sort of rain shower during your trip no matter when you visit this month. Despite the arrival of spring flowers and warmer weather, you'll need to bring a variety of warm and cold-weather attire to make sure you're adequately prepared for the volatile April weather in London. While you could probably get away with a T-shirt and a lightweight waterproof jacket in April, it's best to pack sweaters and extra layers, too. Also, remember to bring a small, easy-to-carry umbrella to bring out with you daily since you never know when a light shower may pop up this month. Each April, London comes alive with a full lineup of festive outdoor events to celebrate the arrival of spring to the city. From a celebration of coffee to kick off the month to the annual London Marathon at the end of April, there are plenty of great events worth exploring on your trip to the city this time of year. Don't forget to stop by Hyde Park to wish the Queen of England a happy birthday on April 21 (even though the official celebration takes place in June), and also be sure to catch a historic boat race on the River Thames in the early part of the month. London Marathon (late April): This huge London sporting event attracts over 40,000 runners from across the globe. 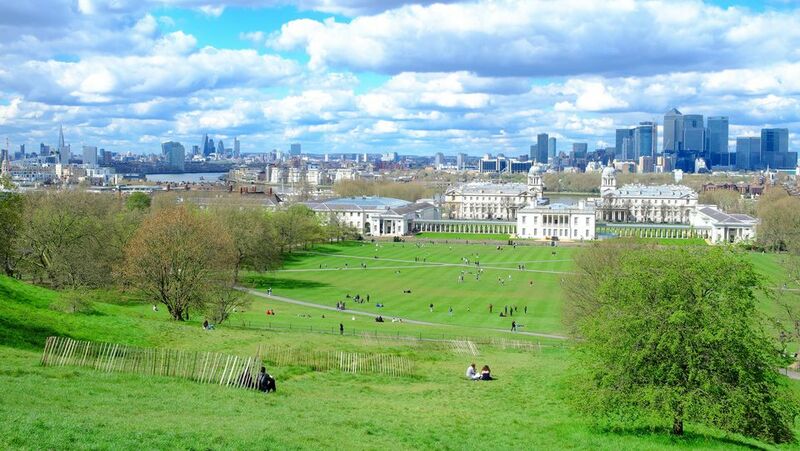 Starting in Greenwich Park, the 26.2-mile route passes some of London's most iconic sights including the Cutty Sark, Tower Bridge, Canary Wharf and Buckingham Palace. Around 500,000 spectators line the route to cheer on the elite athletes as well as the amateur runners. Oxford and Cambridge Boat Race (late March or early April): This annual rowing race between students from Oxford and Cambridge Universities was first fought in 1829 on the River Thames and now attracts crowds of around 250,000. The four-mile course starts near Putney Bridge and finishes near Chiswick Bridge. Many of the pubs that line the riverside put on special events for spectators. Easter in London (Easter can fall in March or April): Easter events in London range from traditional church services to Easter egg hunts to child-friendly activities at some of the biggest museums in the city. The London Coffee Festival (early April): Celebrate London's coffee scene by attending this annual festival at the Truman Brewery in Brick Lane. Enjoy tastings, demonstrations, interactive workshops, live music, and coffee-infused cocktails. London Harness Horse Parade (Easter Monday): Although not technically in London itself, this historic annual event at the South of England Showground in West Sussex features a parade that aims to encourage good welfare for the capital's working horses. Queen's Birthday (April 21): The Queen's official birthday is celebrated on June 11 but her actual birthday is April 21. The occasion is marked by a 41-gun birthday salute in Hyde Park at midday followed by a 62-gun salute at the Tower of London at 1 p.m.
St George's Day (April 23): Each year the patron saint of England is celebrated in Trafalgar Square with a festival inspired by 13th-century feasting. Despite the warmer weather, April is still considered the off-season for tourism in London. This means you'll likely find cheaper airfare and lower prices on accommodations around the city and an easier time booking dinner reservations or visiting popular attractions this time of year. If the Easter holiday falls in April, you can expect government offices and most local shops to be closed for Easter Sunday; additionally, tourists from across Europe typically flock to London for its big celebrations, so travel costs and crowd sizes are likely to increase the week of Easter. April is the perfect month to visit London's outdoor attractions like city farms, zoos, nature preserves, and public parks; be sure to stop by the London Wetland Centre for the spring arrival of a number of bird and plant species. The Changing of the Guard takes place daily at Buckingham Palace starting in April, and thanks to the smaller tourist crowds, you should be able to get a great view of the ceremony if you check it out this month.